Explore the shops of 7 unique retailers located directly across from the largest sand dune on the east coast. Jockey's Ridge Crossing is home to Kitty Hawk Kites, The Fudgery, Natural Life, Kitty Hawk Surf Company, Life on a Sandbar, Scoops Ice Cream Parlor & Life Is Good. There’s always something fun happening during the summer time at Jockey’s Ridge Crossing. Weekly, Summer Sunset Festivals provide entertainment and activities every weeknight from June 4th through September 9th. Looking for something to do with the children? Kids Days are every Wednesday and toy demos, performers from The Lost Colony outdoor drama, pirates, mechanical shark riding, indoor rock climbing tie-dying and more all while a special collection of kites fly overhead. 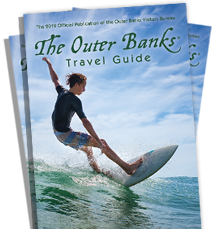 Events like the Outer Banks Pirate Festival, Rogallo Kite Festival, Fly Into Spring & Easter Eggstravaganza and the Outer Banks Watermelon Festival also take place at Jockey's Ridge. For a complete list of events click here. The best part of Jockey’s Ridge Crossing? It serves as one of the best sunset views on the Outer Banks. Watch from the Rogallo Tower as the sun slowly slides behind the sand dunes and melts the sky from blue to orange to pink. No summer is complete without a visit to Jockey’s Ridge Crossing.